The United States jumped out to a 2-0 lead in the match, but could not hold on in a must-win contest against the Netherlands on Monday, falling out of contention for the World Championships title. With the victory over the USA, their first in a major world competition since 2007, the Dutch punch their ticket to the semifinals. The Americans will now battle for fifth place against Japan on Friday, marking the first time since 2006 that the USA will not vie for a medal at the World Championships. Morrison, formerly an assistant with the U.S. Women’s National Team during the 2016 Olympics, solved the puzzle his predecessors had been unable to and sent him home country packing in the race to defend their world title. 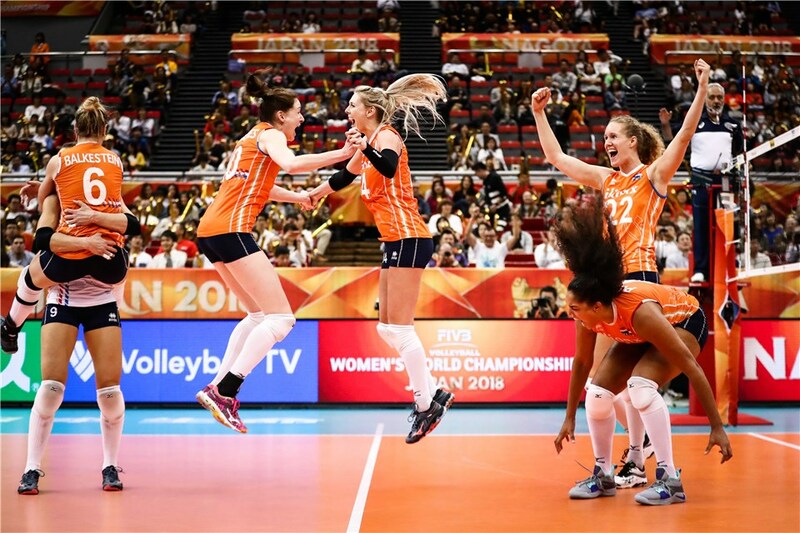 The Netherlands served up 10 aces (to 2) and boasted a 63-62 edge in kills and 11-7 advantage in blocks, while outhitting the USA .250 to .241 to pull out the victory. The Americans earned three extra points on Dutch miscues (34-31). Lonneke Sloetjes piled up 38 points (32 kills, 3 blocks, 3 ace) to lead the Dutch in the comeback victory, avenging the team’s bronze medal loss at the 2016 Olympics. Celeste Plak added 16 points (12 kills, 3 blocks, 1 ace) in starting the final three sets and Yvon Belien tacked on 10 points (6 kills, 2 blocks, 2 aces). The Dutch switched liberos and also added Nicole Koolhaas to the lineup for the final three stanzas. Michelle Bartsch-Hackley and Karsta Lowe did not start the match, but wound up leading a group of five Americans with double-digit scoring tallies. Bartsch-Hackley notched 17 points, all on kills, while Lowe added 15 (14 kills, 1 block). Rachel Adams (13), Foluke Akinradewo (12)and Jordan Larson (11) rounded out the group. Adams provided four blocks for the team, while Larson served up thte team’s only two aces. Setter Carli Lloyd gave way to Micha Hancock after the opening stanza. The Americans trailed 9-2 and 18-11 in the opening set, before charging back to tie the set at 24. Team USA thwarted six Dutch set-point tries and grabbed the 32-30 victory on a block on its own fourth set-point chance. Sloetjes piled up 12 points in the Dutch loss. The United States carried the momentum into Set 2, jumping ahead 8-3 and 16-8 before claiming the 25-15 win on back-to-back kills by Lowe. The teams were level at 16 in Set 3, before the Dutch broke away with a 7-3 run to make it 23-19. Sloetjes closed the door on a 25-22 victory for the Netherlands to extend the match with her ninth point of the stanza. Bartsch-Hackley delivered seven points for the United States. The Dutch built a 12-6 advantage in Set 4 and the Americans were never able to recover as aces by Laura Dijkema and Nicole Koolhaas gave the Netherlands a set-point try. A Team USA service error capped the 25-13 Dutch win. The Netherlands grabbed a 5-2 lead in the tiebreak with help from a block by Plak amidst a 4-0 run. An American service error gave the Dutch an 11-7 edge and a kill by Plak sealed the 15-9 win and put the team into the semifinals.